The Church of St Protus and St Hyacinth was built on the site of an earlier Saxon church in about 1086, but only the north and west walls remain. 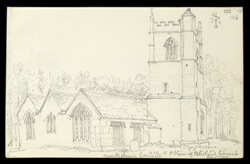 During the 15th century, the tower, porch, south aisle and north south transepts were added. Major restoration work took place at the end of the 19th century. The two saints were brothers who were martyred in Italy in the late third century. Protus was beheaded and Hyacinth was burned. The church at Blisland is the only church in Britain to be dedicated to these saints.